I have acted in amateur theatre on and off for several years but this week was the first time that I totally missed my entrance cue. I will backtrack a bit so you know the story. Impromptu productions, a Kingston-based theatre company has taken on the difficult task of presenting two plays in repertory, alternating performances one with the other. Shakespeare’s Romeo and Juliet is a tragic love story that most people know well. 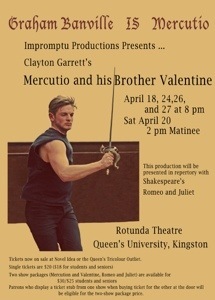 Kingston’s Clayton Garrett has written Mercutio and his Brother Valentine, involving characters mentioned in Shakespeare’s classic and presenting a surprising back-story to the interactions between Capulets and Montagues in “fair Verona”. My part is Prince Escalus. He is uncle to Mercutio and Valentine and has raised them after their parents died. He hopes one of them will be groomed to take over as Prince of Verona to succeed him but there are snags. In Romeo and Juliet, Escalus appears like bookends on the first half and at the end of the play. He has three entrances. In the first scene he comes in to yell at rowdy citizens to tell them to stop their bickering. Then he vanishes for about 90 minutes, only to appear again to exile Romeo for his part in killing Tybalt. At the end he shows up and says, basically “I told you something like this would happen”. Of course, Escalus does make this all sound rather more complicated than it is. But that’s Shakespeare. I decided that I would take my ipad to the theatre and while waiting for my three little entrances, would put together a video of photos that I had taken for both plays. I enjoy photography and also love to share the photos in different ways with friends. So there I was in the hallway outside the dressing room trying to upload a video to YouTube when one of the stage managers hustled in and indicated that I was called to the stage. Usually we get five minutes warning to be in place. I assumed that I had time to pack up my iPad and get into position. I was wrong. It had been only when I failed to show up on the stage that they realized that I was not in place. My entrance was through a solid door at the back of the audience, the door hidden behind a black cloth. Unfortunately, in the dressing room which is in a totally different wing of the building, or even behind this solid door, it is impossible to tell what is happening on stage. I pulled the door open a crack to hear what was going on. Dead silence. What scene was this? Then someone pushed me from behind and whispered “Go Now”. The whole play had, at least momentarily ground to a halt. The next lines (and advancement of the plot) were mine. No wonder it was quiet on the stage. I regally appeared from behind the black cloth onto the stage to be greeted by one of my fellow actors who was looking at me with eyes that were like a deer in the headlights. Tybalt lay “dead” on the floor (likely wondering how he was going to get out of this one). I am sure that there had been a very awkward silence and I owe poor Benvolio a beer. He would have wondered how on earth to get out of this situation if I never appeared. When something like this happens in front of an audience, seconds feel like hours. I was able to jump right in and give my Blah Blah Blah, banish Romeo, tell them to drag the corpse away and confound the audience with the final line of the half – “Mercy but murders, pardoning those that kill.” Lights out. Applause. Intermission. An embarrassing story to tell. Live theatre. Here is the video that I was uploading to YouTube while all this was happening. I hope it was worth it. Mercutio and his Brother Valentine will continue next week at the Rotunda Theatre, Queen’s University, Kingston at 8 pm on April 24, 26 and 27. 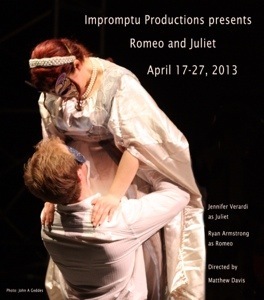 Romeo and Juliet will be at 8 pm on April 25 and 2 pm on April 27. I will try to make my entrances on time. This entry was posted in Uncategorized and tagged gaffe, Kingston, late, mercutio, Mercutio and his Brother Valentine, Romeo and Juliet, theatre by johnageddes. Bookmark the permalink.